The property is made up of gentle rolling hillside with several natural building areas on the bottom sector. Leading up to the back of the property is steeper ground that leads into primary forest. There is huge useable flat area at the top of the finca. Cattle, horses, sheep, llamas, dairy, high altitude coffee, hardwood tree farming, are all realities on this huge parcel. Planted years ago, hundreds of mature hardwood trees are ready to harvest and either sell or use to build your own homes, cabins, and meeting halls. Atenas, Costa Rica Ranked As “One of the Best Places To Retire Abroad’ by AARP. See free video interview with Atenas Realtor Dennis Easters. Ten Wonderful Free Things We Enjoy In Our New Home In Brasil de Santa Ana, Costa Rica. Free video. 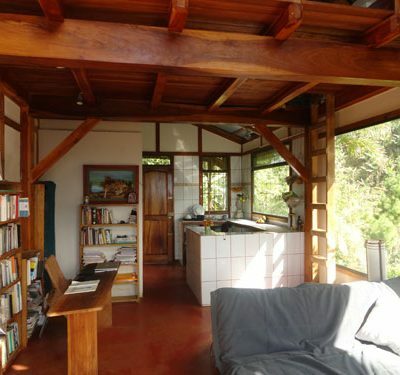 This rustic, artisan timber frame cabana is situated on 4 acres of a former coffee finca that has been regenerated as a nature preserve in the hills above Turrialba. Costa Rica Living in Santa Ana – Free video – Santa Ana is a small town, friendly community. Although Santa Ana (founded in 1658) is one of the fastest growing areas in the Central Valley, with a population under 40,000 – you can still enjoy it’s small town friendliness. Why SolPark Is You Best Choice In New Condos in Santa Ana, Costa Rica with free video. US$197,500 but only three left. This lovely home offers over 500 m2 (5,000+ s.f.) of living space, set on one and a half acres (6,600m2) of tropical landscaped, private gardens.